When it comes to deciding between the use of chatbot NLP (Natural Language Processing) or a more button-focused flow when building a chatbot, there’s a lot to consider. Before we dive into the pros and cons of each, let’s do a quick refresh on what exactly chatbot NLP is. Chatbot NLP is the ability of a chatbot to intelligently respond to a user’s text input by understanding what a user is looking for based on keywords. For example, if someone were to ask a chatbot ‘What is the weather like in San Francisco today?’ most chatbots would identify ‘weather’, ‘San Francisco’, and ‘today’ as the three primary keywords that will dictate a response. Based on those keywords the chatbot will try to find the correct response. Without chatbot NLP, chatbots would not be able to successfully respond to text inquiries and would have to rely solely on visual UX flows such as the use of response buttons. 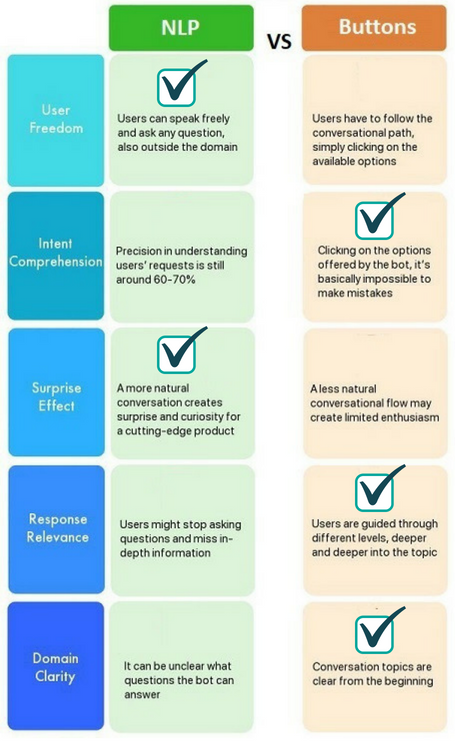 Now that we’ve gotten that out of the way let’s jump into some of the particular pros and cons of chatbot NLP versus chatbot buttons. The pros of chatbot NLP are relatively obvious and straightforward. Chatbot NLP allows users to interact with a chatbot like they would a friend or family member via a messaging app or SMS. 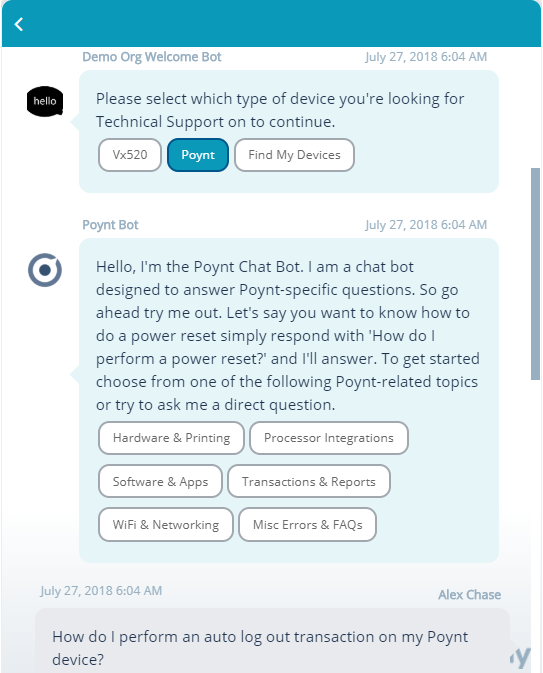 This gives users the freedom to ask whatever they want without knowing what the chatbot’s response will be. The chatbot NLP allows the chatbot to respond intelligently (or at least try to) so the user can get the value they’re seeking from the chatbot. The pros of chatbot NLP, in essence, open up the possibility for its cons. By allowing users to have a clean slate to ask whatever they want, there is far more room for error and misguidance. Poor chatbot NLP can result in a chatbot not understanding the intent of the user’s conversation and therefore responding in a manner that isn’t relevant to the user’s intended conversation. Is the user looking for weather, tech support, contact information, sales assistance, etc.? When it comes to domain clarity, i.e. understanding what topics the chatbot is designed to support, it is imperative to have a well-crafted welcome message that sets the tone for the conversation and lets the user know what topics are in scope. Without, a chatbot is essentially allowing a user to ask anything and everything. That sounds more like the Google search engine than a chatbot doesn’t it? Like chatbot NLP, the pros and cons of chatbot buttons are fairly straightforward. Because chatbot buttons don’t allow users to ask whatever they’d like and instead force them down guided conversation paths, there is less room for error and misunderstanding when it comes to a user’s intent. In actuality, chatbot buttons force intents on the users by only allowing them to go down specific topic flows. This is a stark contrast to chatbot NLP which opens things up entirely for the user and allows them to have more control over the conversation. While chatbot buttons help to set the tone for the domain and scope of the conversation, chatbots that utilize buttons should still have a proper welcome message to reinforce best practices for a successful conversation. Would you start a conversation with a stranger without greeting them first? The cons of chatbot buttons can also be substantial, and if you’re not careful, they can make your chatbot feel more like an app experience than a conversation. Chatbot buttons steer users away from text responses and inherently limit the user’s freedom to shape their own conversational experience. Not only can this seem boring to the users, but it can cause it to take far longer for them to get the answer they’re looking for if they have to go through round after round of button clicks. We strongly recommend a hybrid approach to chatbots that utilizes both chatbot NLP and chatbot buttons. By doing so, you can harness the pros of both chatbot NLP and chatbot buttons while also mitigating the cons of each. 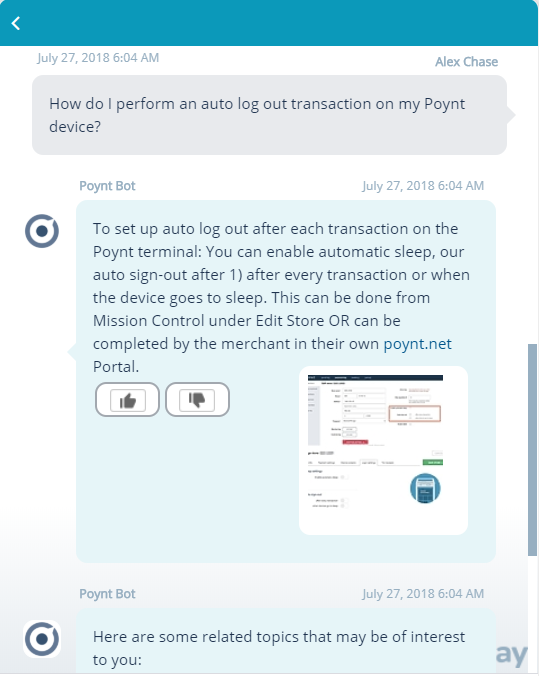 Hybrid chatbots give users the freedom to control the conversation and ask whatever they want if they please via chatbot NLP, while also providing recommended guided conversation flows through the use of chatbot buttons. In this case, the user gets to choose from two completely different UXs based on their preferences and needs. When it comes to chatbots, it’s hard to get much better than that.